Do you remember the moment? 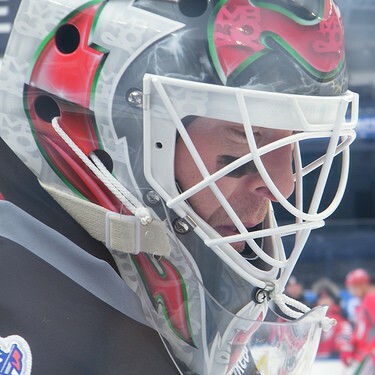 Do you remember the exact moment you became a fan of Martin Brodeur? I do. When I lost my memories post-op, there were only 2 memories I had left of Marty. The first was the moment I became his fan and the other was his 552nd win. Back in the day, I was a Rangers fan. I was at Continental Airlines Arena down by the ice watching the game. Of course, it was a Rangers vs. Devils game I was attending. with the blade of his skate. It was like watching the whole thing in slow motion. You could hear a pin drop with how quiet the arena was. Did we just see what we thought we saw? When the jumbotron replayed the save, it was exactly as we saw. I had to see it twice to make sure that really did happen. As the years went by and I became the Inside Hockey beat reporter for the Devils, I got to witness first hand how Brodeur really was the best goalie of all time. Forget Patrick Roy. Marty broke those records and surpassed him. I was lucky enough to be covering the Devils when he became the most winningest goaltender of all time, the shutout king, the goalie with the most career goals…and the list goes on. Marty best exemplifies what it means to be a winner. He took us all on a very incredible ride. We were all lucky we were able to witness hockey history in the making. On the one year anniversary of the 552nd win, I published this story on my other site. The reason why I chose this one to share today is because it involves one of my other all-time favorite hockey players, Brendan Shanahan. This is one of those side things I remembered about the 552nd win. Funny thing is…Shanahan is trying to prank Brodeur on his big 552nd win day. This, of course, involved some blackmail photos. Like I always say…that was not a typo. One year ago today, Patrik Elias became the New Jersey Devils all-time leading scorer after he assisted on Brian Gionta’s game winner in the 3-2 win over the Chicago Blackhawks, which also secured Martin Brodeur’s 552nd win, making him the most winningest goaltender in the history of the NHL. March 17th is a special day for the New Jersey Devils and their fans. History of epic proportions was made that day. That was the only game that any hockey fan should have been watching that day. It wasn’t because it was a Devils game, it was because hockey history was being made before everyone’s eyes. While Marty was out on the ice celebrating his 552nd win, don’t think that the Irish wasn’t up to some shenanigans on their St. Patrick’s Day. Remember that guy, Brendan Shanahan (NHL VP of Hockey Ops)? Well, he was a New Jersey Devil that day. While I was upstairs snapping photos of Marty’s big day, I caught the Irishman in the act of a prank out on the ice. What you see here is Shanny with Brodeur’s catching glove. Now, the question would be…why is Shanny holding Brodeur’s catching glove? But look here…is that number 18 (Shanny) stuffing Brodeur’s glove under his jersey? Who had blackmail photos???? ME! Shanny fessed up that he was trying to hawk the glove to sell on Ebay. When I showed the photos to Marty, he laughed and told me that Shanny had told him that he was trying to take the glove. He told me that Shanny had returned the glove to him. But when I told Marty that Shanny said he planned on selling the glove on Ebay…you should have seen the expression on Marty’s face. I can’t even explain it…you had to have been there. A few weeks later, I showed the blackmail photos to Shanny who quickly replied that he had given the glove back to Marty. No worries, Shanny got a ‘COPY’ of the photos from his alleged heist (and I kept the originals…are you kidding…that was too good of a moment to relinquish the originals). So today, in honor of Marty’s St. Patrik’s Day, the Devils are bringing back the good ‘ole green and red jerseys (hey, Shanny wore that jersey when he was a New Jersey Devil the first time around). It should be a fun game tonight as the Devils face the Penguins. The Devils are 5-0 this season against the Penguins. This entry was posted on February 9, 2016 by Michelle in hockey, Martin Brodeur, New Jersey Devils, NHL and tagged brendan shanahan, hockey, Martin Brodeur, New Jersey Devils, NHL.